We believe that the spirit of co-operation set forth between all the members of the European Hang Gliding and Paragliding Union must be improved, and one of the best ways to do it, is to make other countries familiar with our domestic rules and laws governing flying activities. The first law controlling flying activities was issued many years ago, and a lot of others regulations were issued ever since. As a matter of fact, plenty of misleading interpretations lead to an uncontrolled situation, mainly because of unpredictable or/and non-applicable characteristics that only recently were completely overcome. We remember to all pilots that every site has different features, and all the attendees are warmly encouraged to follow with attention the specific indications, both for flight characteristics and site access, in order to avoid any possible quarrel with landowners. Life of our sites is strictly dependent from these relationships. We hope the following information will help guest pilots coming from abroad, to approach flying activities in Italy in the correct way, following the rules governing our sport, always keeping in mind that, our behaviour is the passport to the future of air sports. As everywhere, restrictions are at the doorstep, just waiting for a mistake from our side: help us not to give such opportunity to stop flying! Free flight in Italy is strictly controlled by law: this situation differs from other European countries where a lack of regulation can suggest that abroad things go in similar way. 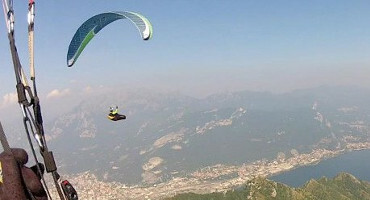 The aim of the following FAQ?s, reflecting law requirements, is to help foreign pilots coming to fly in Italy to be aware of the rules governing hang gliding and paragliding practices, and to behave accordingly. Before moving to Italy for a flying session, always contact in advance, through our web site, the clubs of the area in the region you are looking for. The sites managers can provide useful informations, special restrictions for the time, season or events, sometimes avoiding you an unsuccessful trip: their indications must not be disregarded. Thank you all for your attention and co-operation.